Beef. The New Health Food. 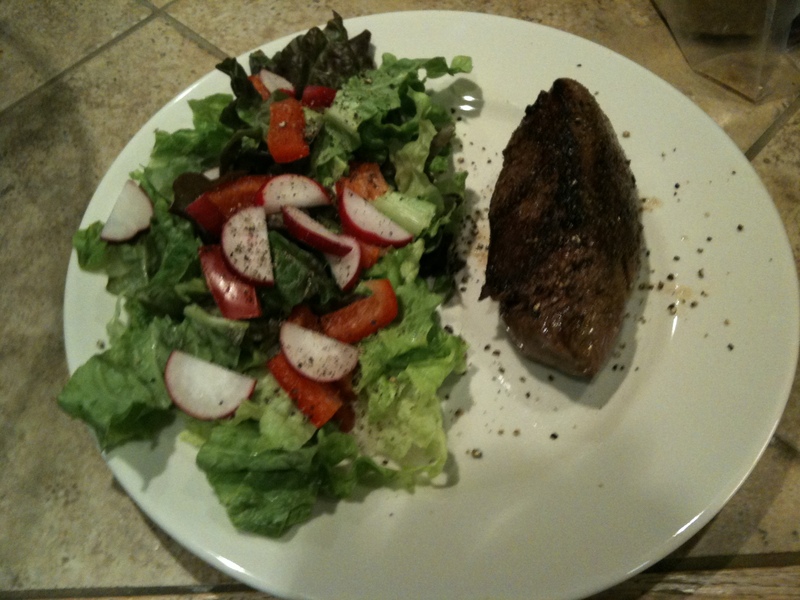 My weather post was not mundane enough, so here is a “What I ate for dinner” post. That is a ribeye steak and a green salad. I grilled the steak in a skillet on the stove because it was too cold and icy outside. It was not as good as if I had grilled it outside, but still pretty tasty. I have been on a low carbohydrate kick lately. For the past month, I have been trying to limit my total carbohydrate intake to less than 20 grams per day. That means I have been eating lots of meat and salads. I am not trying to limit calories, so I eat whenever I am hungry, and it has been pretty easy to keep to this carbohydrate limit – for the most part. For two of those weeks I was traveling and stumbled a little bit on the carbohydrate intake. Mainly by having a couple of beers and some pepperoni rolls. Other than that I have been pretty good about staying below 20 grams of carbs per day. Today is pretty typical of what I have been eating for the past month. Breakfast was two sausage patties and two fried eggs. Lunch was some salami and cheese. Dinner was what is pictured above. Usually, I have a salad at lunch too, but I was not very hungry at lunch time today. The net result is 15 pounds lost in one month. That is pretty remarkable given that I was traveling during two weeks the month. Traveling for a week normally makes my weight go up a couple pounds. Why am I doing such a crazy diet, and why did I lose weight doing it? First, it is not really a diet in the sense of something temporary to create weight loss. I hope to continue restricting carbohydrates indefinitely. If I keep getting results like this month, that will not be difficult. The reason for trying this is a book I read, “Why We Get Fat: And What to Do About It” by Gary Taubes. This is not a diet book. It is more of a science documentary that discusses how we arrived at the current low fat diet and nutrition guidelines the U.S. government and various health organizations promote. In short, they are not based on solid scientific evidence, and in fact there is some evidence that carbohydrates are the real culprits in everything from obesity and diabetes to cardiovascular problems. Gary is careful to not overstate the case, but he makes a convincing argument that scientific studies of low carb versus low fat have not been properly done and should be conducted to help resolve this question. It is a fascinating book even if you are not concerned about how it applies to your personal health. So, I decided to give it a try, and so far it has produced amazing results. Aside from the weight loss, I have been feeling more energetic, had fewer stomach problems while running, and snore less. Now if it would only grow hair on my head. Gary Taubes has an earlier book on this subject, “Good Calories, Bad Calories.” It is a much more in-depth look at the problem, and discusses more of the history behind the current recommendations and how competing recommendations (i.e. low carb) fell by the wayside. I read this after reading “Why We Get Fat” and found both of them fascinating. If you are too busy to read, I recommend this series of videos from a lecture Gary Taubes gave at Dartmouth in 2009. I will give an update in a few weeks. And I will get my cholesterol tested in March to see if it has changed any. Although, if you read “Good Calories, Bad Calories” you will find that should not be too big a concern unless it has skyrocketed above 250 mg/dl. This entry was posted in Cooking, Diet, Food. Bookmark the permalink.